This year, Malaysia will celebrate the 60th anniversary of its independence. As a nation, its citizens have notched up many accomplishments and Malaysia’s prowess in the fields of education, research, sports and entertainment is recognized globally. However, it is not enough to have our talents broadcast abroad while locally we are still gasping for unity and commonality. The fighting spirit of Malaysians must continue to be rekindled so that our survival as an independent nation is guaranteed. This includes efforts to uphold the terms of the social contract that had been agreed between our forefathers and now form part of our constitution. To honour our independence, Malaysians must first be able to assume a common identity between ourselves without differentiation as to place of origin, whether we hail from the peninsula, Sabah or Sarawak. This is to ensure the continuance of the Malaysian essence throughout globalization. In a modern nation, such as Malaysia, where its people are comprised of many races, cultural hybrids and even interracial mixes, it is a myth that ethnicity is the only shared commonality between a people. If we want to move beyond our different cultures to form a modern global society that lives and functions as one, we must be able to create one national culture to be adopted by all Malaysians. The most glaring issue that obstructs the construction of our national culture is the reluctance to fully use bahasa Melayu as our national language. Many Malaysians still do not see the usage of bahasa Melayu as an indicator towards survival of this nation as a united people. This is harmful towards our togetherness because a language has the power of determining a people’s narrative. Hence, the first step towards creating discord in a modern nation state is by dismantling the national narrative through the importation of foreign languages into its national narrative. How are we expected to tell the same narratives when we speak in different tongues? Recognizing the importance of one common language in building national unity, the Reid Commission, that was set up in 1956 to draft a constitution for the Federation of Malaya, recommended the use of Bahasa Melayu, not just as an official language but most importantly as a national language. 60 years down the road this foresight is still not shared by the people of Malaysia. This is especially true if we are to refer to statements made by ministers and politicians from Sabah and Sarawak, and Sarawak more so than Sabah. Perhaps this sentiment is due to the difference between the provisions under Article 153 of the federal constitution and that under Article 161. However, on the eve of our 60th Merdeka Day, must this difference continue to be stressed? Quite recently, Abang Johari Tun Openg was appointed as the chief minister of Sarawak. Among the earliest statements he made was a vow that English will continue to be used as an official language in Sarawak. Incidentally, his guarantee means that basa Melayu will remain as the second language that has little to no place in Sarawak. The liberal media celebrated this assurance as they are globalists and any move to wipe out a national narrative is a move towards globalization. If the members of the Cobbold Commission in 1963 could acknowledge the dexterity of bahasa Melayu as a lingua franca in Borneo, does this not mean that bahasa Melayu has already its place in Sabah and Sarawak? This certainly is the case in Sabah, where the state legislative assembly passed the National Language (Application) Enactment 1973 that adopted the National Language Act 1963/67 and in the same turn, acknowledged bahasa Melayu as the national language in Sabah. Why is S’wak so obsessed with English proficiency? 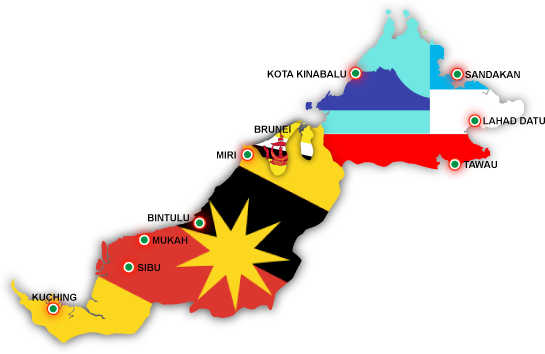 In reality, with this move in 1973, legally Sarawak is now the only state in Malaysia that does not recognize bahasa Melayu as the sole national language. In Sarawak, its ministers and its politicians continue to stubbornly insist on the use of English language as a medium in schools. The only reason to do so is their often-quoted fear of failing to integrate into a globalized world and how Malaysians will never be able to adapt without English proficiency. The truth is, in 2016 Malaysia is ranked 12th out of 72 countries that were evaluated by EF English Proficiency Index. We rank second out of 19 Asian countries for our English Proficiency. Yet this ranking does not seem to be heeded by the liberals who continue to see the accomplishments and abilities of Malaysians as something they need to undermine and belittle. As we approach 53 years of continued existence as a union of one nation between peninsula Malaysia on the west and Sabah and Sarawak on the east, now is the time for Malaysia, and every state that forms a part of it, to celebrate our unity and strive towards stronger commonality. Since our national language is bahasa Melayu, then the whole country should respect its preferred position and hold it in higher esteem compared to any other languages. We will not be able to stand as an independent people if we are still subject to a separate direction. National identity should be given more priority to bring together the people of Malaysia – both in peninsula Malaysia, Sabah and Sarawak – as united citizens of a country in the future narrative of Malaysia. *First appeared in Tanjak.my on February 2, 2017.